SEOUL, June 15 (Yonhap) -- South Korea will shut down its oldest nuclear power reactor next week as the newly launched liberal Moon Jae-in administration has pledged to close aged nuclear reactors and coal-fired power plants. 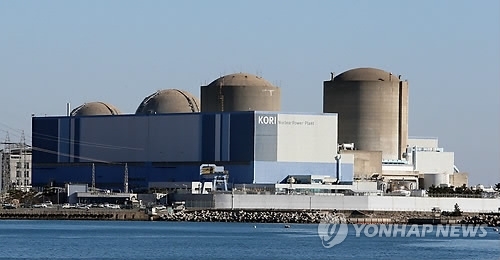 The closure of the Gori-1 nuclear power plant in the southeastern port city of Busan on Monday, which is welcomed by environmental groups, comes amid concerns by some that it could lead to a power shortage and rise in electricity bills. Moon has ordered the temporary shutdown of several aged thermal power plants and pledged to permanently close 10 aged coal power plants during his single five-year term. The chief executive was sworn into office on May 10. The new administration, however, has yet to produce comprehensive measures to compensate for the power production shortfalls caused by the shutdown of the nuclear and thermal plants. It will take up to 15 years for the dismantlement of the Gori-1 plant which began commercial operation in 1978. Its 30-year lifespan expired in 2007 but was extended by an additional 10 years. Moon's election campaign also includes scrapping the ongoing projects for the construction of six new nuclear power plants and the shutdown of nuclear plants including the Wolsong No. 1 Reactor whose lifespan has been extended to 2022 after its initial 30-year cycle ended in 2012. South Korea has 22 nuclear reactors in operation, generating about 30 percent of the country's total power supply. Several nuclear plants have already reached initial operation cycle, including Gori-2, Gori-3, Gori-4, Wolseong-1, Hanbit-1 and Hanbit-2. Two others, the Hanul-1 and Hanul-2 nuclear power plants, have only one to two years left before they can be retired. "We've suspended the project as the government has yet to make a decision on the matter," an official of the state-run company said. The government has been silent on whether to cancel the construction of the Shingori-5 and Shingori-6 reactors, saying "We are still reviewing all the matters involved and will make a final decision later as their building process has already begun." About 30 percent of the construction on the two reactors has already been completed. The government's energy policy has both pros and cons. The trade union of the KHNP has issued a statement demanding the continuation of the construction of the two reactors. As many as 230 professors of energy-related majors said in a statement issued on June 1 that "the government's policy against nuclear power plants is nothing but an imperial, surprise attack by amateurs which risks undermining the national security." 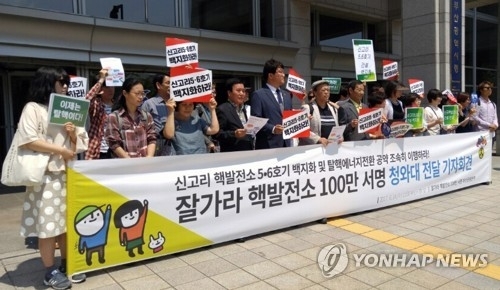 Professors of atomic energy also held a symposium at Seoul National University in southern Seoul on June 8 to call on the government to scrap its policy against nuclear power plants. About 80 residents at a village in Ulsan, South Gyeongsang Province, near the Shingori-5 and Shingori-6 plants have pitched tents in front of the construction site to stage sit-ins against the government's plans to suspend the construction of the reactors. "We ourselves have volunteered to ask the government to build the reactors here," a resident said. "Therefore, the government should stop its move to cancel the construction of the reactors." A group of supporters of the government policy held a similar rally in Changwon, South Gyeongsang Province, Tuesday, saying "The closure of the Gori-1 plant should not be the end but the start of the move against nuclear reactors." They demanded the government stop the operation of all nuclear plants which have exhausted their 30-year lifespan without extending their operation. Environmentalists gathered in front of Cheong Wa Dae in downtown Seoul Thursday to make similar demands before delivering a signature book of 338,000 people supporting the government's energy policy. "We can no longer live near the unstable nuclear plants," they said in a statement. "We should not hand over nuclear wastes, which need to be kept for more than 100,000 years, to our descendants." 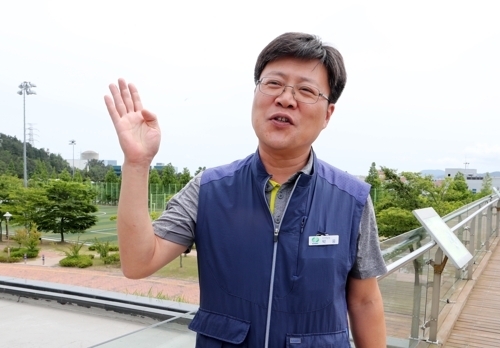 Park Ung, 50, who worked for the Gori-1 plant for the past 34 years, said he was sad people now tend to focus more on the negative side of the reactor rather than its role as the "locomotive of the country's economic development with the supply of power at low prices." Park, the head of the plant's energy safety team, said, "The permanent shutdown seems a bit premature because it still has its own value as a nuclear plant." Kim Dong-cheol, floor leader of the minor opposition People's Party, expressed worry that the government's energy policy will hurt South Korea's nuclear technology and related manpower, and undermine the country push to export nuclear reactors. "How can we export them when we no longer build nuclear plants?" he asked. KHNP officials, meanwhile, said they will now focus on the technology for the dismantlement of nuclear reactors. Besides South Korean nuclear reactors nearing the end of their operational cycle, half of the world's 438 nuclear power plants are currently more than 30 years old. The KHNP said it has yet to secure the expertise for 17 technologies out of 58 technologies for the dismantlement of nuclear power plants. "The dismantlement of a nuclear power plant is a long-term project which takes more than 15 years and costs more than 1 trillion won (US$890 million)," a KHNP official said. "We are focusing our efforts on minimizing nuclear waste while dismantling the Gori-1 plant in a safe and reasonable manner."